In a previous article, I alluded to a particular problem with failing to use the Oxford comma in three-word lists: Some syntactic arrangements result in a noun immediately preceding a list, which makes the veritable listness of the list uncertain. The example sentence used was, “In the midst of chaos, terror and despair were beacons of hope.” That’s the inferior version, of course. 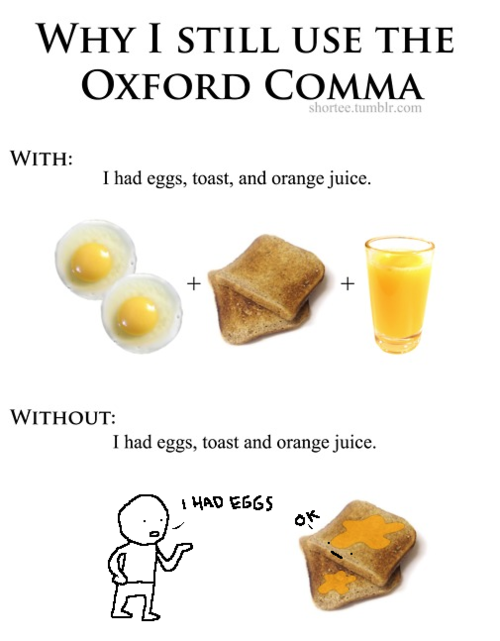 But as the omniscient deity that is Lord Oxford Comma descended upon me recently, He exhibited yet again His limitless benevolence by enlightening me with another possibility. The above arrangement can exist with other types of phrases as well, namely direct address. For a more reasonable (a.k.a. boooring) example, “I invited Jeff, Joe and John.” Evidently, this lack of clarity can arise in numerous instances, making it all the more pernicious if that final comma is absent. This article is too short. This entry was posted in Oxford Comma. Bookmark the permalink.